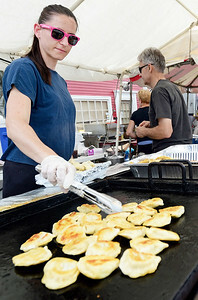 Rob Dicker - For Shaw Media Magda Manikowski (cq) of Crystal Lake browns pierogis on a griddle at one of the many food stands along Robert Parker Coffin Road. Thousands flocked to down town Long Grove on Saturday, June 24, 2017 to attend the weekend-long Strawberry Festival. Rob Dicker - For Shaw Media Gordy Tobutt of Fox River Grover, A.K.A. 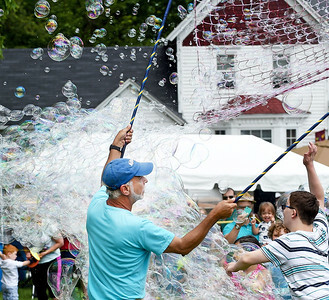 "The Bubbler" creates a wall of hundreds of bubbles with the wave of two sticks and some netting. 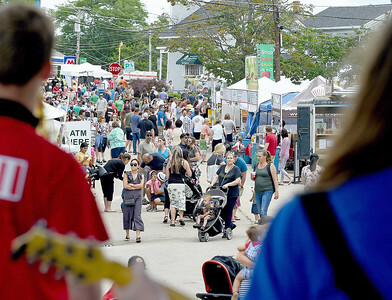 Thousands flocked to down town Long Grove on Saturday, June 24, 2017 to attend the weekend-long Strawberry Festival. 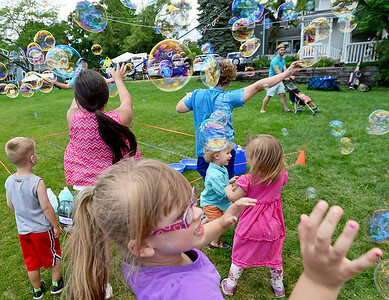 Rob Dicker - For Shaw Media Children scurry around trying to grab and pop bubbles made by Gordy Tobutt of Fox River Grover, A.K.A. "The Bubbler." Thousands flocked to down town Long Grove on Saturday, June 24, 2017 to attend the weekend-long Strawberry Festival. Rob Dicker - For Shaw Media Zac Halap (cq) of Wheeling shares a strawberry with Zoe Dodge-Rice of Carbobdale. Thousands flocked to down town Long Grove on Saturday, June 24, 2017 to attend the weekend-long Strawberry Festival. 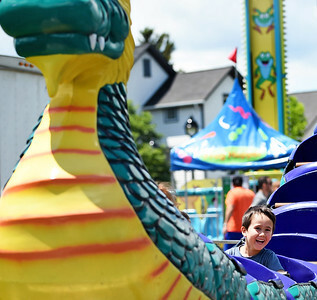 Rob Dicker - For Shaw Media Soran Ozawa (cq), five of Carol Stream enjoys his ride on a children's roller coaster fashioned to look like a dragon. Thousands flocked to down town Long Grove on Saturday, June 24, 2017 to attend the weekend-long Strawberry Festival. 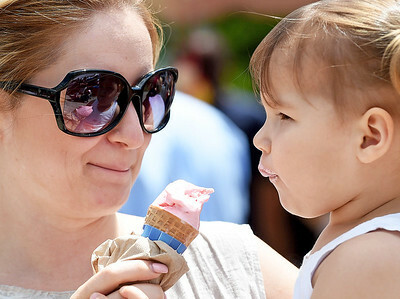 Rob Dicker - For Shaw Media Margaryta Rashwv (cq) of Rolling Meadows shares her strawberry ice cream cone with her daughter, Sofia, two years old. Thousands flocked to down town Long Grove on Saturday, June 24, 2017 to attend the weekend-long Strawberry Festival. 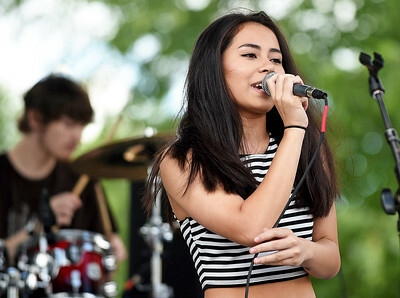 Rob Dicker - For Shaw Media School of Rock vocalist Yanicka Kastner (cq), 14 of Arlington Heights solos on Molly Hatchet's "Flirting with Disaster." Thousands flocked to down town Long Grove on Saturday, June 24, 2017 to attend the weekend-long Strawberry Festival. 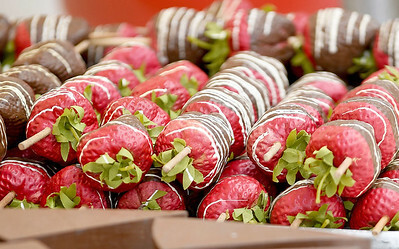 Rob Dicker - For Shaw Media Chocolate covered bananas, chocolate dipped cheesecake and strawberries dipped and drizzled with white and dark chocolate for sale. Thousands flocked to down town Long Grove on Saturday, June 24, 2017 to attend the weekend-long Strawberry Festival. Rob Dicker - For Shaw Media Musicians from the Arlington Heights School of Rock perform for a large crowd of fair-goers at the Long Grove Strawberry Festival. Thousands flocked to down town Long Grove on Saturday, June 24, 2017 to attend the weekend-long Strawberry Festival. Chocolate covered bananas, chocolate dipped cheesecake and strawberries dipped and drizzled with white and dark chocolate for sale. Thousands flocked to down town Long Grove on Saturday, June 24, 2017 to attend the weekend-long Strawberry Festival.